One evening (over a glass of Prosecco) we had a delightful discussion with Yo-Yo Ma over different ways to share music with people and the importance of keeping music in our lives. He mentioned Community MusicWorks in Providence, Rhode Island as being an interesting example of a “storefront” used to offer children string lessons. We played with the idea of a “storefront” that could be used by the community and the University to enjoy special performances of any type of music in a more casual setting. We contemplated that it could also be used to make music education more affordable and more accessible to all, including the provision of introductory lessons on the violin for free. Given Greencastle’s effort to revitalize the town square, Music on the Square (at 21 North Indiana) was inspired and born. We imagined a “storefront” that could be flexible in its format. We imagined that music lessons would take place in a comfortable setting. We imagined that it would be a flexible place that could be used by the community. We imagined that certain performances could take place that are complementary to those you can hear in The Green Center for the Performing Arts. With Mark McCoy’s leadership of the School of Music and the City’s help, we developed Music on the Square (aka Music Squared or M2) and gave it to DePauw University. Sometimes one good idea leads to another. Such is the case with Bridges. With the success of Music on the Square and our creating the 21st Century Musician, we began imagining what could happen next. The location next door (19 North Indiana) was up for sale, so we bought it and began thinking of what would be complementary. We started imagining Bridges as a wine bar offering interesting wines to Greencastle. But we soon added a wood burning pizza oven from Italy and more of a restaurant evolved. Ultimately, the idea of Bridges Wine Bar was born. The basement has become a private dining room called The Cellar, an open terrace area on top of the building, which will be used in nice weather, called The Rooftop, and there will be three fully furnished rental apartments which we call The Lofts at Bridges. We hope you will like our addition to the Square of Greencastle. Chef Sal Fernandez grew up in Napa and studied at the Culinary Institute of America in California. His passion started at an early age. Surrounded by restaurants such as The French Laundry and Meadowood, he aspired to work with some of the best chefs. Chef Sal has trained under Chef Rogelio Garcia and Chef Brandon McGlamery, both Thomas Keller Alums. He believes that working with those great chefs and his six years in the military have contributed to his leadership in the kitchen. 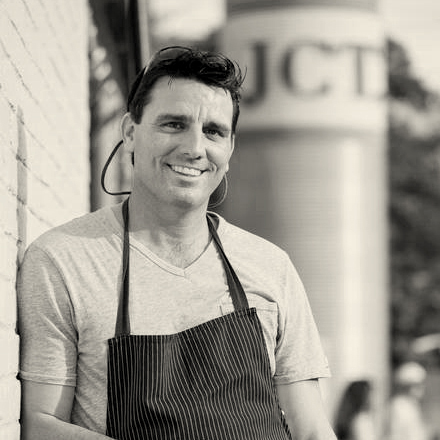 Chef Sal joined the Bridges project because he was intrigued with the opportunity to come up with something new and creative for Greencastle, DePauw University, and the surrounding communities. The restaurant is his passion and he hopes to make a unique statement. The opportunity to work with an authentic wood-burning pizza oven from Italy and create an environment that brings people together in a casual/social setting was enticing for him. Chef Sal’s philosophy for Bridges is simple: "Great Food and Great Service." That is the philosophy his team will live by every day! Damion grew up in Jamaica and began his career at an early age by working in the family restaurant alongside his father, who was an accomplished chef. He has had extensive experience in the restaurant business working in a number of top-rated restaurants in San Francisco, Malibu, New York and the Cayman Islands. Damion was fascinated with the Bridges project because he loves the challenge of combining “big city style service with small town values.” The idea of restoring an old historic building and turning it into a place of social interactions in a variety of settings interested Damion. He loves the excitement of offering fine wines from around the world.